Residents of Nocatee, one of Florida's newest master planned communities, have a treasure trove of outdoor amenities to enjoy, including a number of parks and playgrounds, a water park and even two nearby golf courses. The jewel in the crown, however, is the Nocatee Greenway. Consisting of over 5000 acres of inter-connected parks, wetland preserves and wildlife corridors, the Greenway Trails have been carefully laid out using over a decade of planning in order to provide residents access to the area's natural splendor. Most paved roadways are enhanced with biking and jogging trails, and an extensive network of unpaved nature trails will lead you on a glorious journey through some of the most breathtaking natural scenery that Florida has to offer. More than 60 percent of Nocatee's real estate has been set aside by The PARC Group and designated permanent preserves, never to be developed. This environmentally sensitive land is home to a wide variety of flora and fauna, and hikers can often see such protected species as American bald eagles, gopher tortoises, wood storks, Eastern indigo snakes and Sherman's fox squirrels, along with various wading birds and other indigenous area wildlife. The natural, unpaved trails are ideal for hiking, jogging, mountain biking, nature photography, bird watching and horseback riding, and are open daily from sunrise to sunset. The Ponte Vedra area is known for its horse stables and ranches, and the new trails will likely be quite popular with equestrians. Electric cart paths will soon connect all of the Nocatee neighborhoods, providing easy access to all of the different parks, the fitness center, water park and the Town Center. Nocatee is the first planned community in Northeast Florida to be Electric Vehicle (EV) approved, providing eco-friendly alternative transportation for residents to get around anywhere within the Nocatee community. 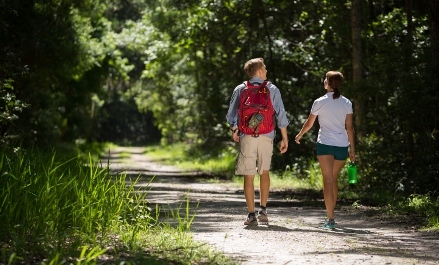 In February of 2010, the first three miles of the new Greenway trails were inaugurated, connecting the neighborhoods of Riverwood, Tidewater, Coastal Oaks and Willowcove to the Nocatee Community Park, the Splash Water Park and the Nocatee Town Center. Development continues on the rest of the interconnecting trail system, including miles of multi-use 16-foot-wide pathways along with 1200 feet of bridges that will meander throughout the wetlands. For Nocatee residents and St. Johns County residents alike, the Nocatee Greenway is a splendid example of sustainable development, as well as a valued part of the local community for all to enjoy for many decades to come.